The science of cosmology has an ambitious goal: to understand the Universe in its entirety, trace its evolution, and possibly even predict its future. That's despite the fact that we're trapped within a minuscule region of space and can hardly see beyond the tips of our cosmological noses. Unlike other scientists, cosmologists can't grow the object of their study in a petri dish to observe its behaviour and see what happens when you tweak certain aspects of it. One advantage cosmologists have is that they can see far into the past. Some of the light that reaches our telescopes has travelled through the Universe for a very long time, so when we observe it we are seeing what happened long ago. "Cosmologists are like palaeontologists," says Hiranya Peiris, Professor of Astrophysics at University College, London. "We are looking at 'fossils' from the past and try to explain them in a coherent framework." But where do you even begin constructing such a framework and how do you know it's right? Cosmology is based on mathematical descriptions of the Universe: mathematical models. When you look out into our Solar System you quickly realise that its large-scale behaviour is driven by the force of gravity. It's because of gravity that planets orbit the Sun and moons orbit planets. The same goes for the Universe as a whole, which is why cosmological models are based on our best theory of gravity: Einstein's general theory of relativity. The theory is phrased in terms of mathematical equations whose solutions describe a universe in which gravity, matter, time and space behave just like Einstein prescribed (see What is general relativity to find out more). Such a universe doesn't have to be exactly like ours, however: a Universe consisting of a single Sun, for example, could also satisfies the equations. To make sure you obtain solutions that describe a Universe like ours, you need to add some constraints. One constraint is that we're after a universe that changes over time, as ours does, unlike other solutions to Einstein's equations which always remain the same. "We also assume that the Universe is homogeneous and isotropic," says Peiris. "Homogeneous means that when you go from place to place it looks the same, on average, and isotropic means that when you look in different direction in the sky [while you yourself stay put] it also looks the same, on average. These are clearly not true in this room we are sitting in, but when you average over large volumes of the Universe we assume they are true." These assumptions are reasonable. Together with colleagues Peiris has shown that, based on current observations, the odds of our Universe being isotropic are 121,000 to 1. Homogeneity is harder to test, but once you have accepted isotropy, a lack of homogeneity would imply that our location in the Universe is somehow special, an idea that physicists reject. "Given these assumptions you can come up with some quite simple equations called the Friedmann Robertson Walker (FRW) solutions," says Peiris. "They give us a model of the global structure of the Universe and its evolution in time." These solutions were first derived and studied in 1922, seven years after Einstein published his general theory of relativity. Since then new observations have led to new ideas: we now know that the Universe is not only expanding, for example, but that it's expanding at an ever-increasing speed (find out more here), and that mysterious substances called dark matter and dark energy play an important role in the Universe. Cosmologists have shaped the FRW solutions in response. The result is a cosmological model, called the standard model of cosmology, that depends on six parameters. One is the density of ordinary matter. Another is the density of dark matter. Since gravity plays such a major role in the Universe, and gravitational pull is exerted by massive bodies (dark or otherwise) it make sense that the model should depend on these two parameters. The third parameter is the density of dark energy, which accounts for the fact that the expansion of our Universe is accelerating. The fourth parameter is the geometry of space. The last two parameters are needed to allow the formation of large structures such as planets and stars: they describe the time the first stars formed and the clustering properties of matter in the early Universe. Einstein's theory of relativity, which describes the force of gravity, is the basis for modern cosmological models. If you change the values of any of these parameters, the predictions of the model will change too. For example, the assumptions and isotropic tell you that it can only have one of three geometries: it can be what mathematicians call flat, negatively curved, or positively curved (find out more here). The geometry of the Universe dictates its fate. For example, in the absence of dark energy, a positively curved Universe will eventually collapse on itself, leading to a big crunch," says Peiris. "A negatively curved Universe will keep expanding forever. And a flat Universe will coast along between these ideas, still expanding, but not like a negatively curved one." To understand the Universe from the model, you therefore need to get the values of the parameters right: you need to find those parameter values that best fit the observations. Since universes can't be created in the lab, observations are limited to what we happen to be able to see in the sky. A great breakthrough in this context was the discovery of the cosmic microwave background (CMB), essentially a baby picture of the Universe. The wealth of information it provides has turned cosmology into a precision science in which parameter values can be pin-pointed to a good level of accuracy. Concerning the geometry of the Universe, for example, the CMB has told us that it's almost certainly flat. Dark energy does exist, so the relationship between the geometry of the Universe and its fate is a little more complicated than mentioned above. "But still, you can work out from the geometry what the fate will be: it is going to expand forever," says Peiris. "This means that it's going to be a cold, bleak death." The grand aim of cosmology, and physics more generally, is to find a model that describes absolutely everything there is in the Universe. But cosmologists are not megalomaniacs. 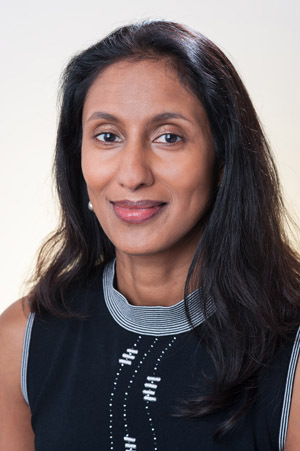 "[Our models] are always just temporary descriptions of our current understanding," says Peiris. "We don't claim to know everything about everything. All models are wrong, but some are useful." 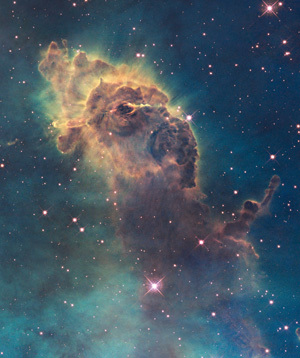 Images like this one of the Carina Nebula, taken by the Hubble Space Telescope, don't only show us space but also the past. Image: NASA, ESA, and the Hubble SM4 ERO Team. "[The model based on the FRW solutions] is the minimum model that describes the data," Peiris explains. If you leave one of those parameters out, then the model gives you predictions that don't chime with our observations, but with all those parameters included it does fit those observations remarkably well. That's one indication that cosmologists are on the right track. It's perfectly possible, however, to come up with descriptions that fit the data, but are still horribly wrong. Scientists from other fields deal with this problem by testing the hell out of their models in experiments: the more experiments a model survives, the more likely it is to be a good one. Cosmologists can't usually do that, but there is another standard by which their models can be judged. "In my opinion [a model] shouldn't just explain all the data you currently have," says Peiris. "It must also make predictions for new data we have not yet obtained. That predictivity substitutes doing experiments in a sense." If a model predicts something people had never thought of, and that something is found, then that's another good indication the model is a good one. Dark energy is an example of this idea. Initially a theoretical prediction from an Einstein-based model, observations eventually confirmed that something like dark energy must be out there. "The model [with no dark energy] reigned for a very long time, but then the data came in and suddenly you could tell unambiguously that [this model] was dead." So does the standard model of cosmology tell us all we need to know about the Universe? Far from it. There are still plenty of mysteries that need to be solved. The fact that the Universe appears to be homogeneous poses one of these puzzles. To see why, think of a cup of milky coffee. If it's homogeneous — has the same milk-to-coffee ratio everywhere — then that's because milk has had the chance to flow into every region of the cup. According to standard cosmology, however, some regions of the observable Universe would never have been close enough for signals of any kind to flow from one to the other in the time the Universe has been around. And if no exchange was possible, how could the regions have ended up with the same properties? 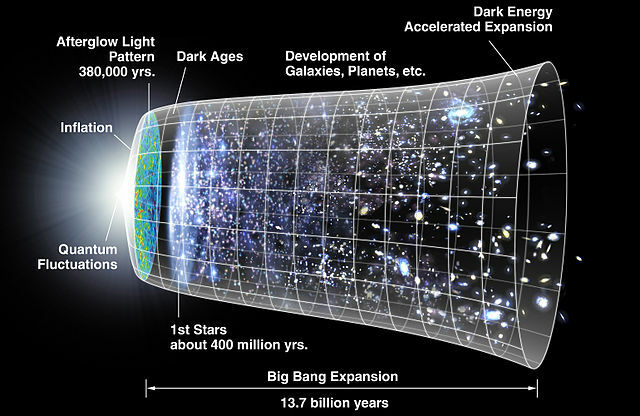 This image illustrates the presumed history of the Universe, starting with the Big Bang on the left, followed by a period of exponential inflation, the time the picture of the cosmic microwave background was taken, and so on, up until today. Image: NASA / WMAP Science Team. A potential answer to this riddle comes from an idea first floated in 1979 by the cosmologist Alan Guth. He suggested that for the briefest moment right at the start the Universe, a moment lasting only 10-32 seconds, the Universe may have inflated exponentially: it expanded much more rapidly than standard theory suggests. Before inflation the Universe was small enough for all of its regions to have been in contact and come to an equilibrium, just as your milky coffee. Inflation then blew some of these regions so far apart that, naively, it looks like they could never have been in contact. Problem solved. The theory of inflation hasn't been completely confirmed in experiments yet, though things are looking good. Several of its predictions, for example that the Universe is flat, have been confirmed by the cosmic microwave background. What's more, the CMB suggests that planets and stars grew from tiny fluctuations in the density of matter in the early Universe and inflation can explain how these came about. Cosmologists hope that more precise measurements of the CMB will give them more clues as to whether inflationary theory is correct. Inflation is an example of physicists thinking up ways of extending or changing existing models to deal with problems. This is something that happens all the time, and it's not an objective process. "How to construct additions to the standard model is partly based on people's physical intuition," says Peiris. "Anybody can make predictions based on their intuition of how physics should go. It's a taste question. The important thing is that once you make the taste-based extrapolation you go and [test] it against empirical observations." Over the past century or so, physicists' intuition of how physics should be built, often based on mathematics, has been amazingly spot-on. But while being proved right is obviously great, being proved wrong is even more exciting. "We want to discover new things," says Peiris. "Confirming predictions of [a given] model is not as exciting as finding an observation that we can't explain. That means we need to stretch ourselves and stretch our models."